Living by the water was always a dream for us. 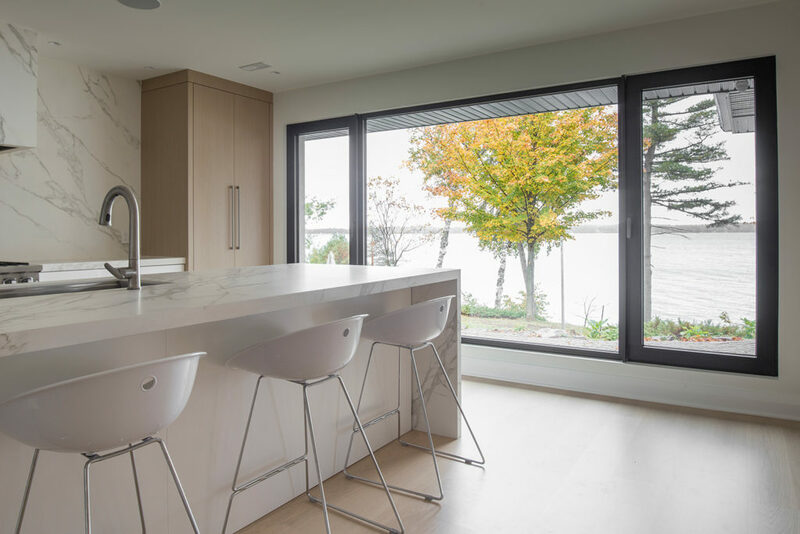 We wanted a simple, elegant and contemporary living space where the focus was to bring the “outside in” with natural finishes and light filled rooms to complement the lake and forest views. Family is important to us so having a home and space that could accommodate and entertain multi generations was essential in the initial design. The white walls in our home allow the natural light to fill the space and create a backdrop for our vibrant Canadian artwork. 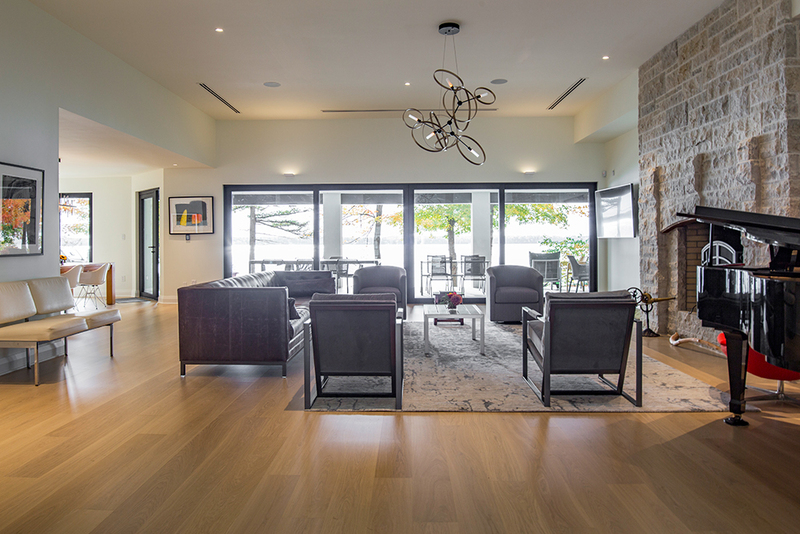 The knotless, long and wide plank flooring is a true statement that complements the stone to ceiling fireplace. The windows and doors are a key element in our contemporary home. 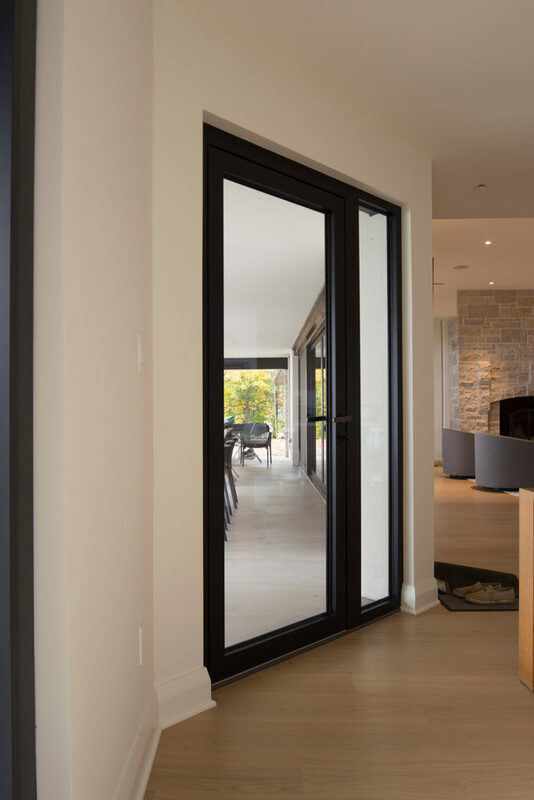 The flexibility of being able to open the double sliding doors creates a panoramic view and expands the entertaining space. We wanted to create zones so different groups and ages could be in the home simultaneously. The young adult and teenage zone has a more casual feel with an oversized television, sectional sofa, fireplace, fridge, ping pong table, and games storage. The sliding doors that lead to the patio give access to the dock and boathouse. The modern, open concept kitchen has a large island and 14 foot table with an adjacent seating area for cocktails and conversation. The space opens up completely with double sliding doors to the patio featuring an outdoor pizza oven and a fireplace. The doors and windows are without a doubt the most important element of our home. They truly maximize our waterfront view and the true beauty of the property. The quality and timelessness of the doors and windows add great value to the house. Big Glass Openings were true professionals throughout the project and provided continuous consultations to find the very best solution for the build. Their follow up to bring the design and concept into reality was outstanding. The doors and windows in this project were manufactured and installed by Big Glass Openings, in Barrie, Ontario. The products utilize profiles from Reynaers Aluminium, which are designed in Europe. When paired with quality glass these products are tremendously energy efficient and maintenance free.